We thought ROUSH kinda missed out this year’s SEMA. But no! 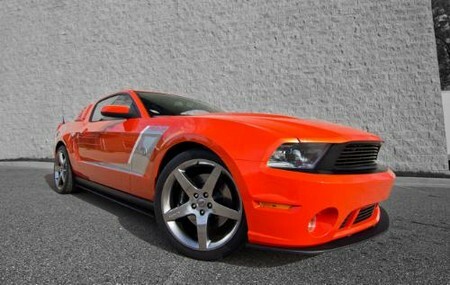 They’ve been preparing this, the ROUSH Stage 3 Premier Edition Mustang. Roush was joined by NASCAR Sprint Cup series and Roush Fenway Racing team driver David Ragan as together they uncovered the dazzling orange ‘Mat It Mango’ 2012 Mustang, which also featured highlighted, painted graphics in its exclusive ‘Sin City Silver’ and ‘Performance Pearl’ colors. The Premier Edition paint colors compliment the aggressive 540HP ROUSHcharged 5.0L engine and the race-inspired ROUSH suspension.